Extreme Energy 6-Hour Shot is a potent concentrated energy drink that contains no sugar, many vitamins, and herbs that are believed to be energy enhancing. This shot comes in two flavors; orange explosion and wild berry. It's available at 7-eleven, walgreens, GNC, CVS and other retailers. How Does Extreme Energy 6-Hour Shot Compare? 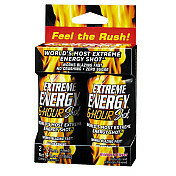 Extreme Energy 6-Hour Shot contains 110.00 mgs of caffeine per fluid ounce (371.95mg/100 ml).